But my favorite spooky classical piece (albeit less so now than when I was a kid) has always been Danse Macabre by Camille Saint-Saëns. (Listen to it here.) It's based on a medieval allegory about dancing skeletal figures from all walks of life - the rich and the poor, the powerful and the peasants - all called by Death. (Hey, these people were dealing with the Plague.) I remember being exposed to this musical masterpiece back in elementary school, and even seeing a cartoon that went with it. 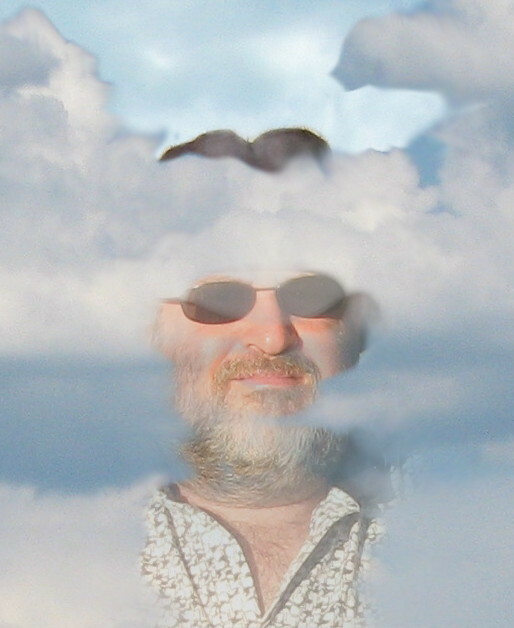 But like that blog entry about spooky music, I can't prove that what I remember ever existed. 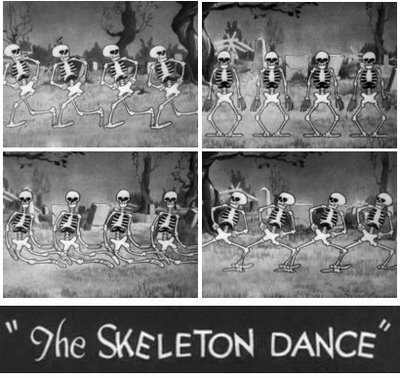 Yes, there's a great Disney cartoon called The Skeleton Dance, the first Silly Symphony ever made. I've even read claims that the music for that was the Danse Macabre, or, at least, that brilliant cartoon composer-arranger Carl Stalling adapted the Saint-Saens for it. But it just doesn't sound like it to me. Ah, well. 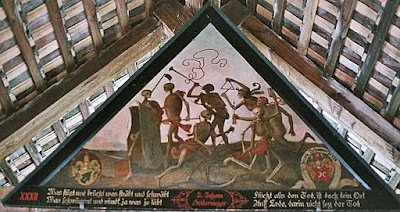 Next you'll tell me there is no wooden bridge in Lucerne, Switzerland that depicts the Dance of Death on its wooden panels. But there is. I photographed it when I was 15 years old. And no, I don't have the pictures. Extra Credit: well, I am a little spooked that I can't prove what I remember, and also that it's past 2:30 AM already! I found info on that Danse Macabre filmstrip from when we were kids. It's a music appreciation series and came with one cassette tape and 2 filmstrips. It came from what is now known as Educational Record Center in Wilmington, NC and they say it's "no longer available in any format." Sure wish one of those teachers out there with access to it would put it on YouTube! Oh, cool! Thanks, "j"! Yes, it would be great to see that again after all these years. - K.
I too have seen the filmstrip for Danse Macabre! LOVED it! I too remember seeing this Danse Macabre film strip at a school, around about Halloween 1981. There seems to be a "Second Edition" of an animated Danse Macabre available on DVD here: http://www.clearvue.com/productDetail.asp?objectID=21442 (this page contains a partial preview viewable via Mediaplayer or Quicktime) Any chance this "Second Edition" is adapted from the same filmstrip? The "animation" seems to be created from still images (unless this is an artifact of the preview). In my memory, the animation was "darker" different but I'm not sure I trust my memory! Re that music appreciation DVD clip, it does seem likely that it's adapted from some set of still illustrations, such as possibly that filmstrip. I kind of thought what I remembered was black and white, but a) they could have colorized it, and b) my memory could be tainted by the Silly Symphony. Thanks for the detective work, folks, and I hope you all had a great Halloween (2006, 2007, or whatever year you read this)! i know this is a little late...But...Yes it is adapted from it. I previewed it and I would recognize those bags of bones any day. And yes, though Disneys was in black and white this was in color. I have been making it my mission to find this frakin thing ...this is close enough. Bummer its not the first edition. One day we might yet find it. Oh and Skeleton Dance is not set to Dance Macabre. But I still am asking myself if the last scene in Halloween is Grinch night is somewhat Dance Macabre. I think it is. Thank you guys for finding this and Happy Halloween!! I'm probably pretty late to the conversation, but I remember that filmstrip I last saw in 1974 like it was from 1990 ... which is to say I remember parts of it very vividly, but not every part of it. Most notable in my memory was a recurring (and chilling for a small kid) still of a skeleton face wrapped in a green cloak (over his head) with a violin under his neck. You could see his skull face (as opposed to a similar still from the link (no longer working but I searched to site linked to and found it)). And the art work was much better/more detailed than what is in the animations at the link. So good, in fact, that I would have thought the art work would have stood on its own and that the filmstrip cobbled it together for use with Danse Macabre. It really was quite well done for such a simple medium, and like others, I have spent much time searching for it, or the art work, online. Found it! I too was fascinated by this film strip as a kid in the early 70s. I recently purchased the film strip and audio cassette on ebay. It is from a company called Educational Audio Visual, illustrated by Harold Dexter Hoopes. I have no projector but it looks just like I remember it. I want to make a transfer and post it on YouTube or something. Any thoughts on how to make the transfer? Anonymous - I think if you do a little digging, you should be able to find a video transfer service to do this, perhaps even locally if you live in or near a city. Good luck! I have also been searching for this for years. My elementary music teacher showed this every year at Halloween (early 80's). Everyone kept telling me I was remembering "Dancing Skeletons", but I knew better. Hope to get a copy in some digital format to show to my kids. Obviously, I'm far from the only person who remembers this Danse Macabre filmstrip fondly, and would love to see it digitized. So, here's my challenge to the world: make it so! with art by Harold Dexter Hoopes. try to restore the time-faded image. Meanwhile, there are a number of videos on YouTube featuring the Danse Macabre, including the 1980s one mentioned above, which is apparently a completely separate production from the 1960s one. None of the YouTube videos are as good as that darn filmstrip is in my memory, but they're worth checking out! There are a few original animations there, and others are illustrated with medieval artwork. There's even a silent film, accompanied by a 78 rpm recording. Oh, and by the way, if you're a Buffy fan, you've probably heard Danse Macabre. That was the music Giles played to go with his transparencies about the Gentlemen in the classic episode "Hush. " Which leads me to wonder: did Joss Whedon also see the filmstrip growing up? Someone has posted a rather wonderful seven minute version of the episode on YouTube, beautifully synched to Danse Macabre as a soundtrack. Classic! 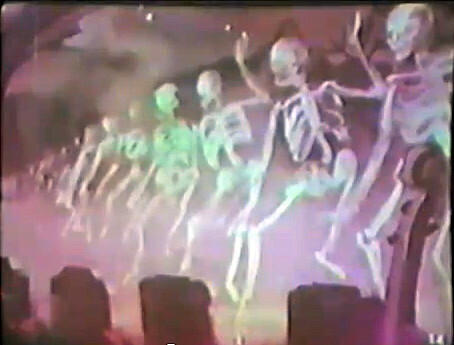 And a further note about the Disney Silly Symphony "Skeleton Dance." The same year, 1929, a Mickey Mouse cartoon called "Haunted House" reused part of the animation of the dancing skeletons. While not as good as the Silly Symphony itself, the Mickey cartoon is a bit of a breakthrough in that the music is integrated into the storyline, with the house's spooks forcing Mickey to play an organ so they can dance to it. Both cartoons can be seen on YouTube. Some things (or people) explode into the culture, are really big for a while and then overstay their welcome. Who or what are you really tired of seeing, hearing or reading about these days? Extra Credit: What discarded bit of pop culture do you remember fondly? It's nothing in the real world I'm particular sick of, neither problematic politicians nor pubescent pop stars, nor even drug-addled divas. No, I need to rant for a bit about that fictional subculture of life-deprived men and women whose idea of a nice meal out is a large quantity of A-pos: the vampires. I've never been a vampire fan, although I probably dressed as one once in some long-ago Halloween. I'm never read Bram Stoker's work. I found Bela Lugosi's most famous film (excluding Plan 9 From Outer Space) mildly diverting and briefly thought-provoking, but it's nothing I'd watch again. I think. I tried to watch Roman Polanski's The Fearless Vampire Killera once at Halloween, and suffered through about half an hour before turning it off. And I've never seen Nosforantu. There's a 1979 version of Dracula for which I've basically only seen the ten minutes Sylvester McCoy was on screen, saying his three lines. So no, not much of a vampire fan. Buffy with Spike, the most entertaining of vampires. When Buffy the Vampire Slayer came to theaters, it certainly didn't sound like something I'd enjoy, so I initially ignored it. Even when it came to television, I wrongly assumed that the goofy sensibility of that title announced a lowbrow character blundering her way through a send-up of a genre I didn't like in the first place. 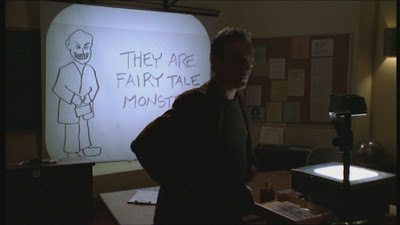 It wasn't until Season 6 of Buffy that I found out how wrong I was. After checking out a few Season Five episodes in rerun, John and I started seriously watching the show. We bought the DVDs and enjoyed the heck out of them, and Angel as well, although the spinoff about hunky vampire Angel and friends ended very badly. On the day the cancellation of Angel was announced, actor Danny Strong, who played Jonathan on Buffy, inadvertently reenacted on of his scenes with me, asking if I was "Karen with a K" when giving me his autograph. and Giles (Tony Head) with his chain saw. "Fear Itself,"
Buffy was a great, great tv series, and Angel was mostly a very good one. But it wasn't because the two shows contained vampires. Joss Whedon built up a whole culture and cosmology around his version of the creatures, from their place in the demonic pecking order to the handy way they turn into dust when staked. But that wasn't ultimately what the show was about. It was about the difficulties of growing up, life and death and doing homework, alienation and friendship and the power to make a difference. More often than not, the vampires and other monsters were metaphors for some real-world problem. But none of that would have mattered had the show not been populated with a large ensemble of great characters, humans, vampires and none of the above, interacting with a modern sensibility and sharp, witty dialogue. Great stuff. But the lightning that was Buffy could not be captured in a bottle. To take one of the least interesting aspects of that show, the vampire legend, and retell it in movies, several different tv shows and innumerable books is to dilute and cheapen the concept, making it even less appealing to the non-fan. On the big screen even before Twilight, we had Van Helsing and that vampires-vs.-werewolves movie Underworld and sequel(s). On the small screen there's True Blood in the U.S., full of mildly interesting characters continually ruining their lives; in the U.K. there is Being Human, with mostly the likable vampire, werewolf and ghost trying to have semi-normal lives and ultimately failing, plus a show called Demons featuring a young, alienated scion of the Van Helsing legacy. In books there are several mashups of Jane Austen with various monsters, a demon-hunting Queen Victoria, and lots of beautiful young detectives (or waitresses, or whatever) who either love vampires or are vampires themselves, with a few Slayer wannabes thrown in. And if these new books on the fantasy and YA shelves don't have vampires, they make do with zombies or werewolves. Frankly, by the time Twilight became ubiquitous as bestselling books and movies, I was so sick of the whole thing that I never gave the franchise the chance. What I've read or heard about Edward and Whatshername does nothing to entice me. And discarded pop culture? Well, I was a Star Trek fan before Star Trek came back the first time, and a Doctor Who fan before Doctor Who came back for the second the third times. These days, with Doctor Who going strong and Star Trek having wrung every drop pf Trekkie goodness from itself before drying up, only to releaunch as a rather good film with a new cast, I'm really rather satisfied at the moment! As part of the Round Robin Challenge: Bridge, a couple of people mentioned the famous bridges of London. This reminded me of a bridge John and I took pictures of on our 25th Anniversary trip to Las Vegas back in 2004. 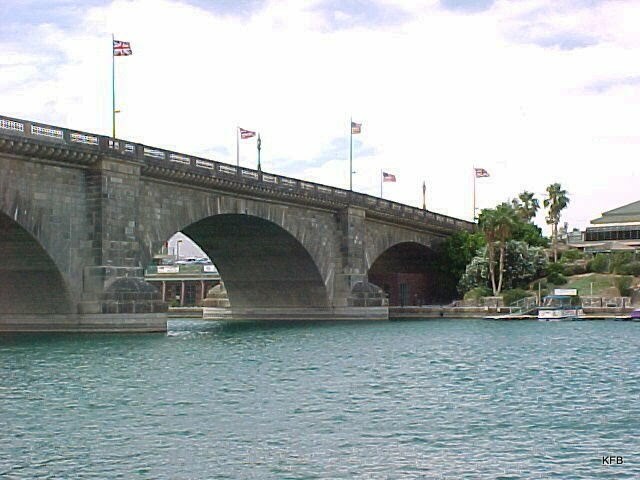 We stopped off on the way in Lake Havasu City, current home of London Bridge - well, a London Bridge, anyway. 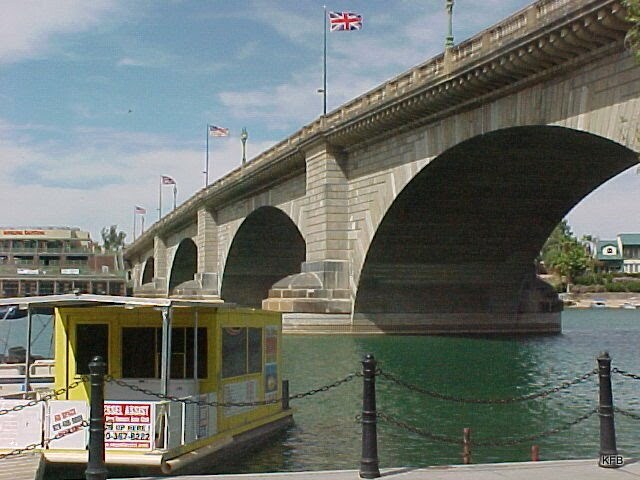 Here it is, London Bridge, as it crosses over a bit of Lake Havasu in Lake Havasu City, Arizona. Actually it crosses a canal at the edge of the lake. Actually, the lake isn't really a lake, but a man-made reservoir behind a dam. 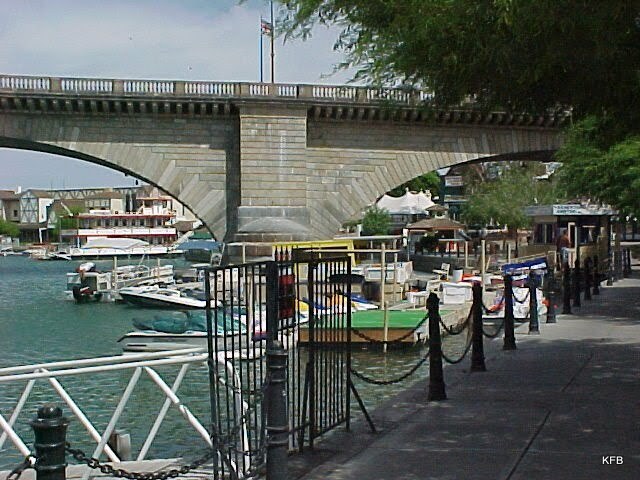 Lake Havasu City is a planned community, home to retirees, water sports and the relocated 1831 London Bridge. Except that it isn't quite the original 1831 bridge over the Thames (built by John Rennie and his son, John Rennie), much less the older bridge that one replaced. This one is a concrete bridge, covered with stones from the 1831 bridge, which were numbered and transported to the new site for reassembly. In many cases the stones were trimmed to fit the new structure, which was built on dry land and completed in 1971. After that, the canal was dredged underneath it. Unsurprisingly, the tourist area around the bridge looks no more authentically British than its origins suggest. It's kind of fun, though. And you can go houseboating on a warm and sunny day, in the dead of winter! By May, though, the time of year we visited, the tourist season is pretty much over as the temperature rises into the 90s. Here's my other entry for the Round Robin Challenge: Bridge. 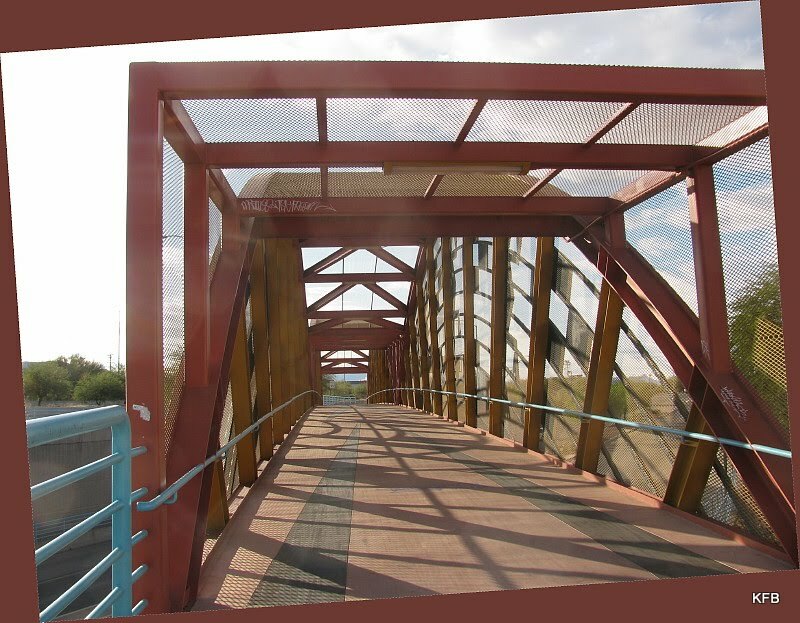 If you scroll down for the first one (and I hope you do), you'll see photos of bridges all over Tucson, taken over the past several years. The photos in this entry, on the other hand, were all taken today, and concentrate on two specific, very unusual bridges. You may remember (or not!) 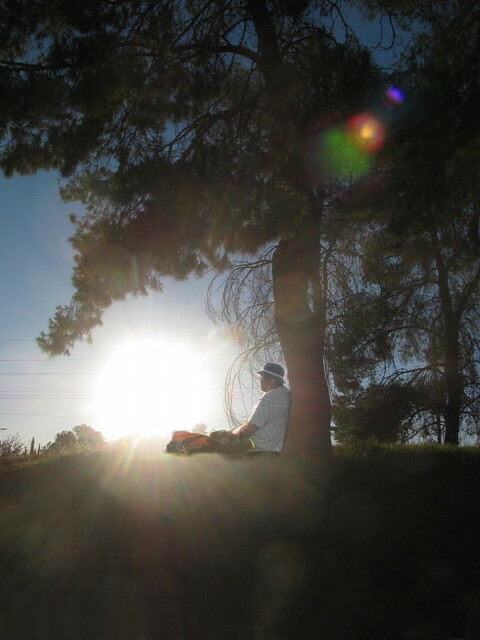 that in January 2008 I had a mini-adventure of a photo shoot, hiking around downtown Tucson for a Round Robin Challenge called Landmarks. 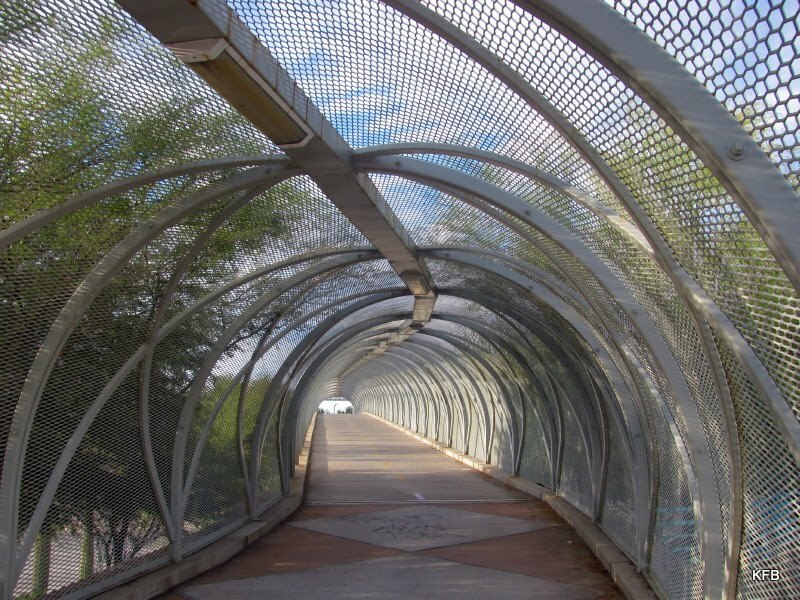 I took many pictures that day of the Diamondback Bridge on Broadway just east of downtown, for a blog entry titled Round Robin (Part One): Crossing the Snake. There were some cool shots in that, but I wasn't really satisfied. 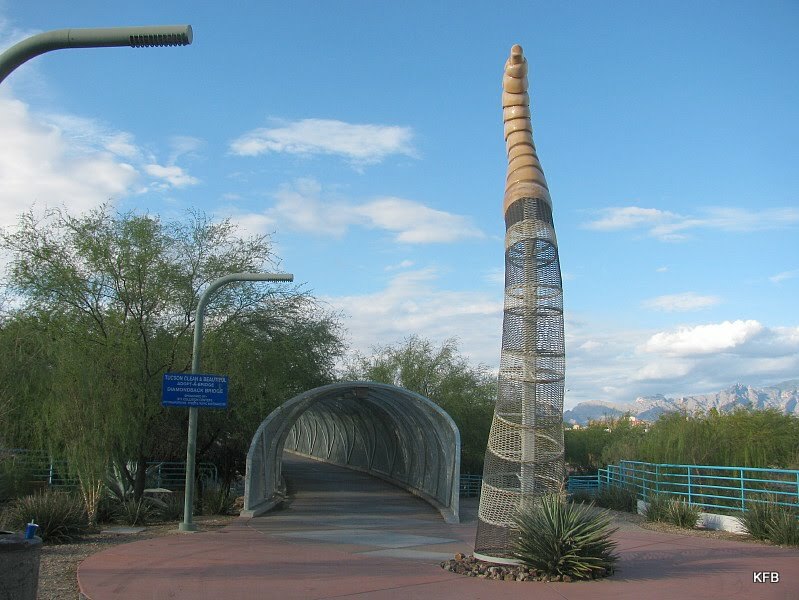 As you can see, this concrete and steel bridge is in the shape of a Diamondback Rattlesnake, from head to raised rattle tail. Problem is, there is no really good vantage point for photographing the entire bridge. Narrow objects a few hundred feet long aren't the easiest of subjects. Compounding the problem are the trees on both sides of the road, which obscure details. But I had an idea. There is a skyscraper downtown called the Unisource Energy Tower, formerly the United Bank Building. It's the tallest building in the area, and close enough to provide a good view across the intervening buildings and down onto the bridge from above. Maybe. So this afternoon I drove down to Congress St., parked and fed the meter, and headed over to the distinctive building, intending to take the elevator inside all the way to the top. First problem: even if you take the right elevator, you can't get to then 23rd floor without a keycard and a code. Second problem: even on the 22nd floor, there is no window that is not in someone's private business office. I didn't want to barge in to a high-priced accountant or law office and ask to take pictures out their windows, so I left. Next I drove over the construction firm whose parking lot is adjacent to the Diamondback Bridge. I might not be able to get better pictures than last time, but at least they would be fresh ones. Here are a few of them. Here's the head and part of the body, as seen from the southwest. See what I mean about the trees? And here's the tail, as seen from the walkway leading into the bridge itself. 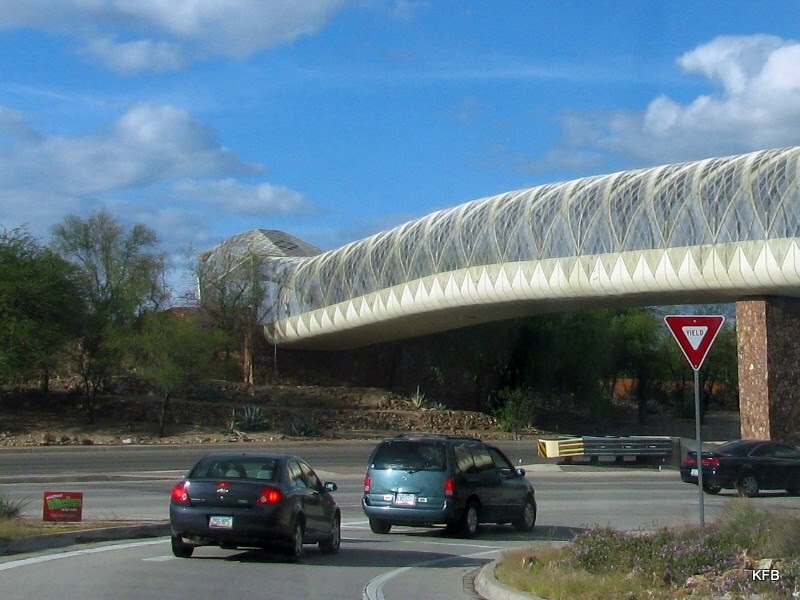 The snake's concrete and steel body is designed for bicycles and pedestrian traffic only. The tail is strictly ornamental. Here's how it looks on the inside. Unfortunately it is not quite as nice as it was a few years ago, due to tagging and places where the paint (possibly more than paint) has been scraped away. What I didn't notice the last time I visited the Diamondback bridge is that if you follow the walkway south of the tail, you come to another bridge I've been trying to photograph for years. This one is a little over three years old, if I recall correctly, and a little tricky to get to. I usually pass it on an adjacent highway at 55 mph! But on foot it's just over a quarter mile from the Diamondback Bridge, as I discovered late this afternoon. 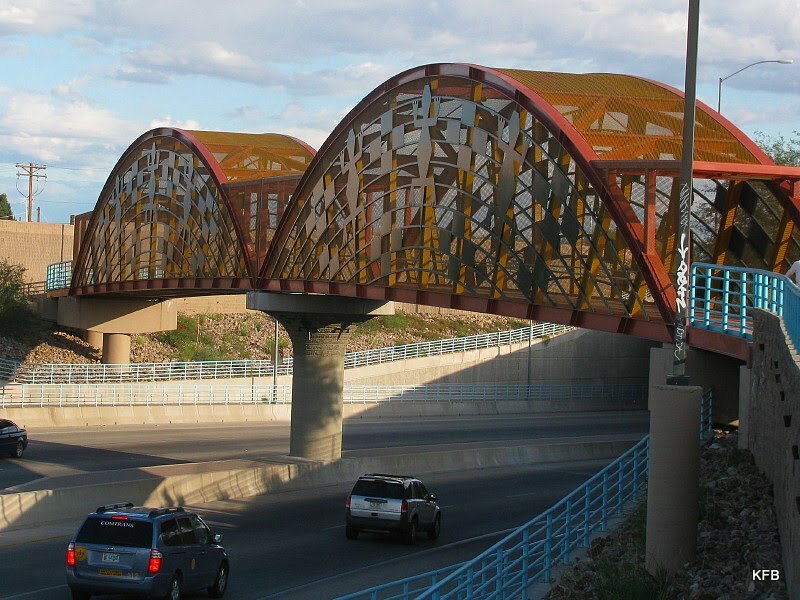 Like the giant snake over Broadway, this bridge has a motif honoring the local fauna. The sides are covered with stylized lizards, probably inspired by designs on petroglyphs. 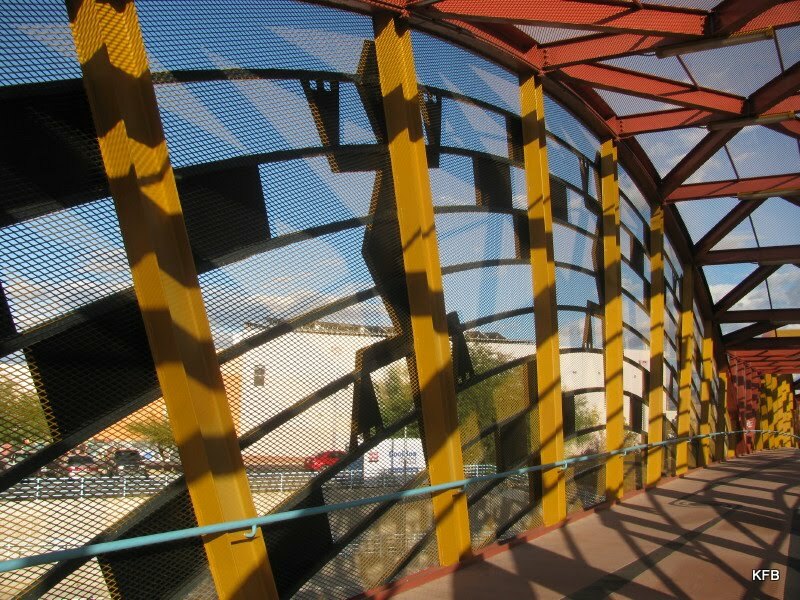 This is another bridge for pedestrians and cyclists. Inside it's just as trippy as the snake bridge. With its rust red and school bus yellow girders, it could almost be a ride at an amusement park. Whee! 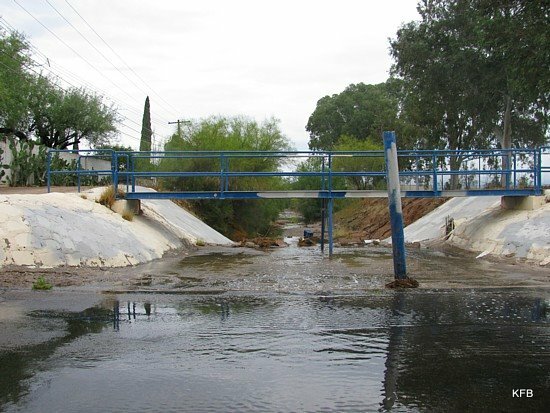 Be sure to check out "The Bridges of Pima County" as well! This is one of two posts I'll be doing tonight for Round Robin Challenge: Bridge. Please scroll up to see the other one, entitled "The Snake and the Lizards" (no, really!). This Round Robin topic was suggested by Steven of the much-missed (sometimes)photoblog at the beginning of 2009. I've been wanted to do it ever since. 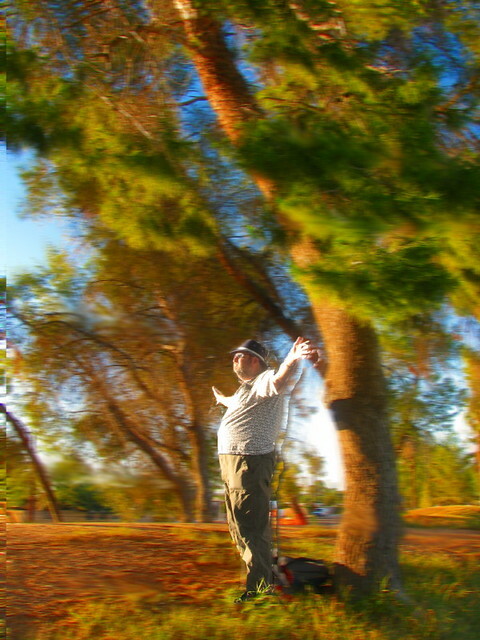 That was about a year after I did a major photo shoot for a particular bridge at the edge of downtown Tucson. Actually, there were three bridges in and around downtown that I found photogenic. 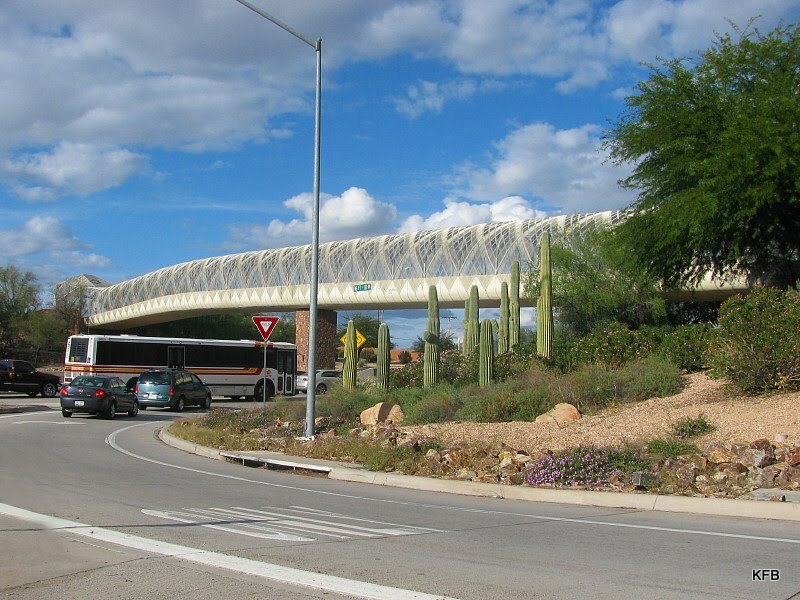 Over the past several years I'd photographed those bridges and at least three others in other parts of Tucson. Here is a sample from my archives. In my other "Bridges" entry, I'll be showing you new pictures of two of the bridges, taken earlier today (Friday). 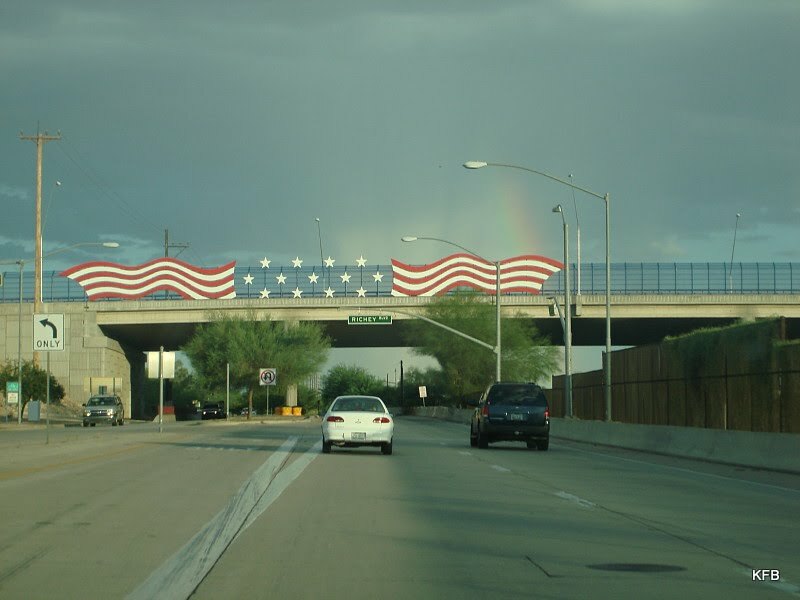 From August 2007: Rainbow Over the Veteran's Memorial Bridge. 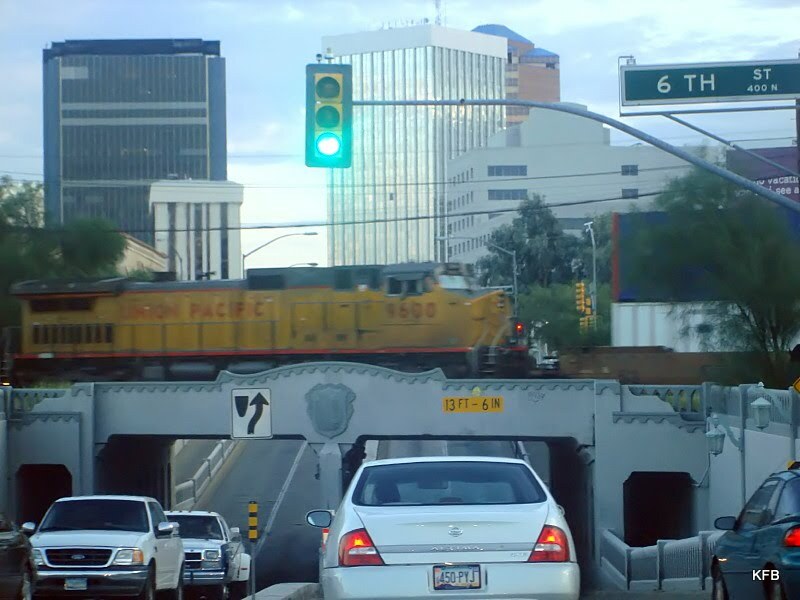 From September 2007, newly reedited: my favorite old railroad bridge (the Stone Ave. one) in downtown Tucson, at rush hour. 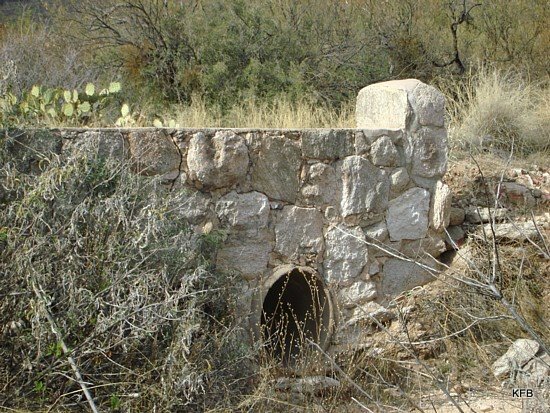 Here's one of the bridges of Sabino Canyon, built by FDR's depression-era agencies: the ERA, WPA and CCC, by way of economic stimulus. Photo from January 2009. This blue footbridge over Alamo Wash in my neighborhood needs repainting. May 2009. 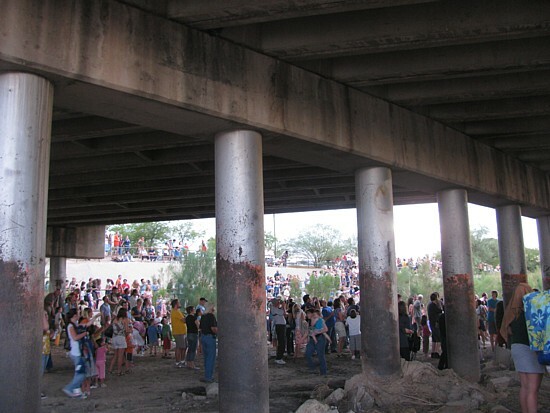 In September 2009, thousands of Tucsonans stood under this bridge where Campbell Avenue crosses the dry Rillito riverbed, waiting for thousands of bats to fly away at dusk. Well, why not? Now let's go see everyone else's bridges! Be sure to check out "The Snake and the Lizards" as well! Weekend Assignment # 340: How Far Would You Go? Some people travel hundreds of miles (in extreme cases, thousands of miles) to see a concert by a favorite performer, or to meet their favorite writers at a convention, or to attend some other kind of public appearance by someone they especially admire. Other people don't even bother to go downtown to take advantage of such an opportunity. How far would you go to meet one or more of your favorite writers, actors, musicians, comedians or other artists, and to attend a performance by him or her or them? Extra Credit: What is the farthest you have ever gone in a similar situation? The Doctor: Do you want to come with me? 'Cause if you do then I should warn you, you're gonna see all sorts of things. Ghosts from the past; aliens from the future; the day the Earth died in a ball of flame; it won't be quiet, it won't be safe, and it won't be calm. But I'll tell you what it will be: the trip of a lifetime. Okay, so I'm never going to travel by TARDIS with the Doctor, except through the media of television, books and the imagination. But there's a "trip of a lifetime" opportunity coming up in November. 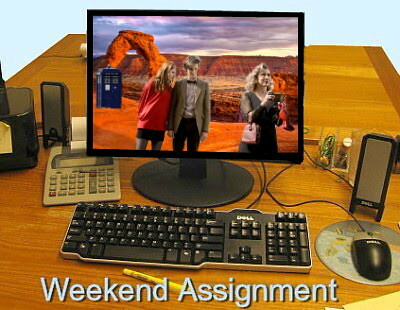 It involves the Doctor, and real life travel. It's very much the sort of trip I used to make back in the early 1990s, but even more adventurous. Unfortunately, it looks as though I can't go. I'm having trouble accepting that. 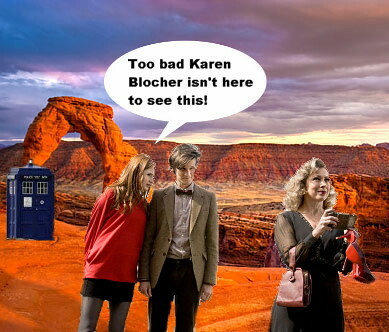 The cast and crew of Doctor Who are going to be filming part of the 2011 season opener in Utah in mid-November. Utah is just one state away from Arizona. It's a place I've never been, and have wanted to visit since at least 1986. Matt Smith, Karen Gillan, Arthur Darvill and Alex Kingston are expected to be filming in the Utah desert for about five days, about 600 miles away from me. My all-time favorite show has never filmed a scene in this hemisphere before, aside from a few Second Unit plate shots in New York City several years ago with no cast present. For them to suddenly be almost in reach of my eyes and my camera is driving me nuts! Heck, fans in parts of Wales get to see them filming fairly often, but for American fans, this is probably a once-in-a-lifetime occurrence. It's driving me crazy that I can't do anything about it. What's the problem? Money, of course. I'm back down to one part-time job, supplemented by the dregs of my unemployment claim from 2008-9 because working for a church that doesn't pay SUI means I don't qualify for a new claim. John is working overtime, sometimes seven days a week, trying to get his work done and make up for my lack of income. He quite reasonably believes that it would be foolish and unfair of me to take off for Utah, spending money we can't really afford on gas and most likely a rental car, even if I promise to sleep in the car and live on peanut butter sandwiches. 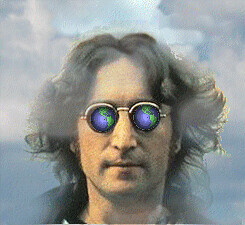 He's probably right, but John, I really, really, really want to go! 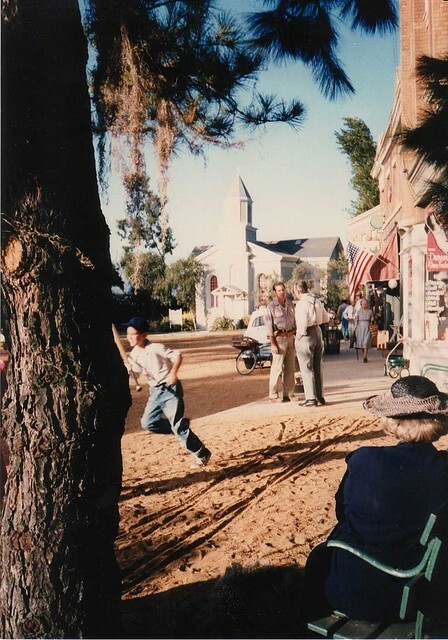 Quantum Leap filming on the Universal lot, 1992. It wasn't always like this. 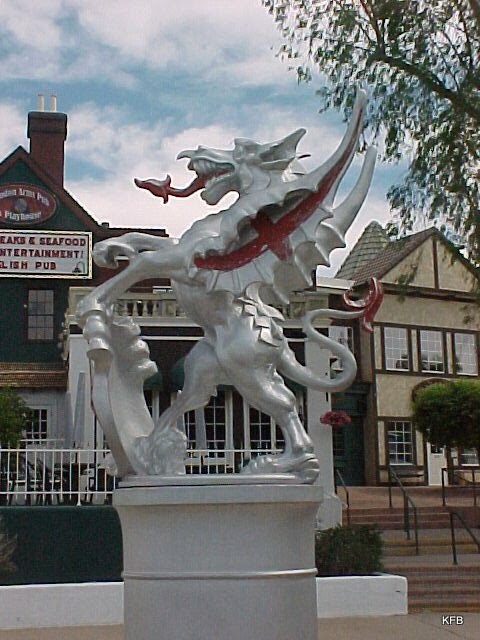 Back in 1990 through 1993, I used to drive the 500 miles or so to the Los Angeles area a couple times a year, indulging my Quantum Leap and Doctor Who habits. I think there were two years in which the Gallifrey One and Quantum Leap conventions were the same weekend, and my friends and I scrambled to attend both. 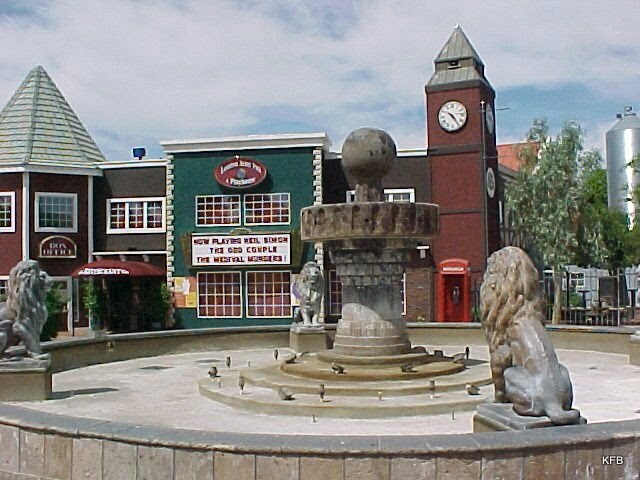 Other times we drove to Universal Studios and managed to talk to people in the production office, interviewing writers, actors, producers or directors, or some combination thereof. 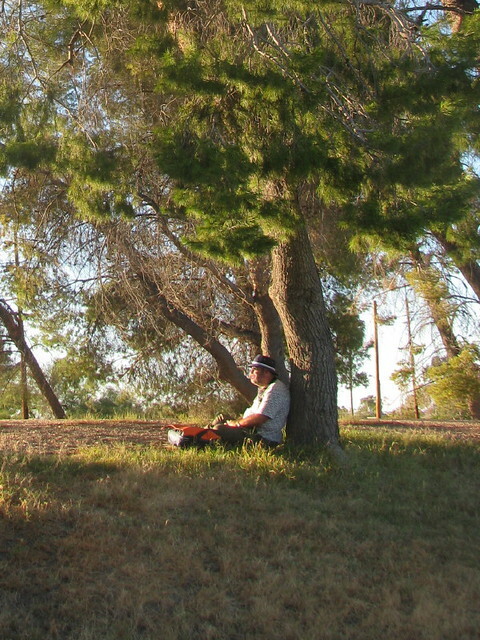 On one of our last Leap trips, my car's transmission died forever north of Palm Springs. 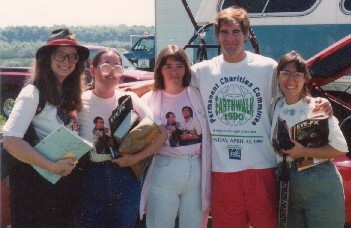 I sold the Capri to a junkyard and we flew off to Los Angeles, where we watched filming on the Universal lot, and interviewed Scott Bakula for the first and only time. Oh, and I lost our return airline tickets and hard to borrow money to buy more. It was a heck of a weekend, but absolutely worth it. It's easier to do things like that when you have a full time job to help pay for it, an understanding boss to give you the time off, and a couple of like-minded friends to share the costs. The situation is different now. Back then, I had Teresa and Tracy and D.C. with me, and sometimes John. For a while there on the mid-1990s, John was making enough money from Cornerstone that we used to make his own trips to Los Angeles, mostly to visit Japanese bookstores. John and I also drove out to see Paul McCartney at the Forum, and Ringo's all-star band in Newport Beach. One year we went to a Beatlefest, which was held at the same downtown hotel that served as the backdrop for the Moonlighting series opener. Nowadays, sad to say, Ringo and Paul could be performing together in Phoenix, with every band I ever liked as opening acts, and I probably wouldn't know about it, much less make the two hour drive up for it. I've already seen most of the rock acts I care about, and don't really want to hear Paul perform again with his voice ruined by age and a lifetime of Twist and Shouting. Even if I did, though, I can't do it. We thought $17.50 or $19 per ticket was outrageous when we sat behind the stage for The Who circa 1982. We certainly don't have hundreds of dollars to spend now on a major concert. But for Doctor Who, now, that's different. Whenever I can, which is about half the time overall but less often now than in the glory days, I at least try to get to Los Angeles for the Gallifrey One convention, to meet and listen to the people who made or are still making my all-time favorite show. And I sure wish I were going to Utah. Drat! I know I had a good anecdote to tell you for Weekend Assignment #339: Happy Endings. What was it? Tell us about the last day of anything: the last day of school or a job, your last day as a smoker, the last day before you moved or got married, the last day before you got that car you always wanted, or even the last day of a particularly memorable vacation. Here's the catch: I'm looking for happy memories here, happy endings rather than tragic ones. Extra Credit: What happened the next day? Oh! I remember. It was the last day before I graduated from high school. I think it was a Friday. Final exams were over, and for the Fayetteville-Manlius High School Class of 1975 the morning had been given over to a graduation dress rehearsal. The ceremony would be the next day. They must have dismissed us around 11 AM or noon, but I either didn't go home or came home only to go back out. I thought that, this being my last day in the F-M school district, it would be nice to visit a few teachers from when I was younger - much younger. 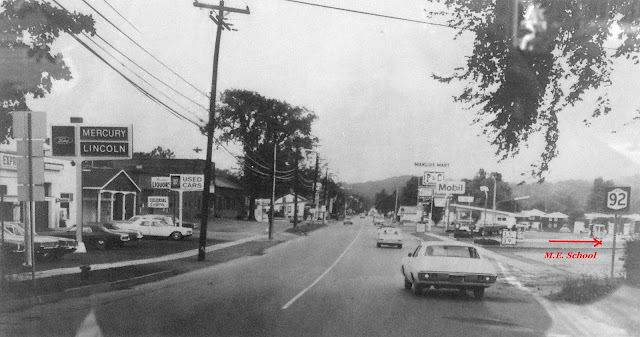 The school in which I went to fourth through sixth grades was long gone, and the junior high had moved even further toward the edge of town several years earlier. 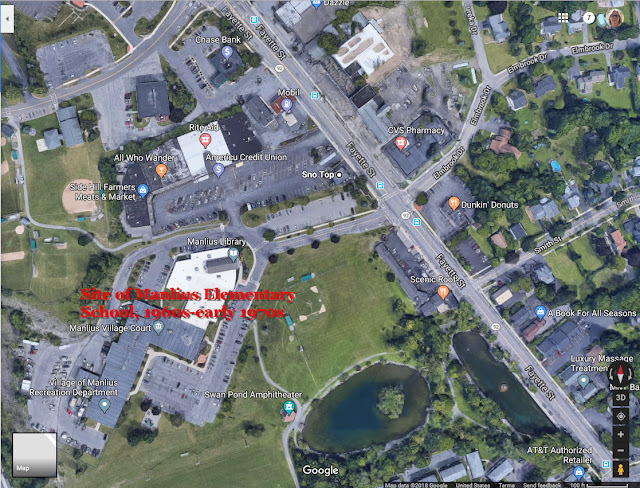 But Manlius Elementary still existed, and was right across the street from Temple's Dairy Store in the village of Manlius, about a mile from my house. So that's where I went. I'd had a succession of kindergarten teachers in two different schools, and I don't know where my second grade teacher, Miss Nevin, was by 1975. My last encounter with her had not gone well, so I wasn't all that interested in seeing her anyway. But my first grade teacher, Mrs. Livingston, and third grade teacher, Miss Olds, were still at the old school when I arrived. The elementary school wasn't having classes that afternoon, either, but the teachers were there, finishing up for the day and for the school year. Surprisingly, as I recall, Mrs. Livingston and Miss Olds (they probably used the term Ms. by then) were in adjacent classrooms that day instead of two different hallways by grade. Even more surprisingly for me, they seemed to be close friends. When I dropped in on Miss Olds, who remembered me, she wanted me to go see Mrs. Livingston, too, which I did. Understand: Miss Olds was my favorite teacher in elementary school, while Mrs. Livingston was my least favorite. I'd had run-ins with Mrs. Livingston. She marked me down for not finishing all the problems in Getting Ready to Read, when she knew I was already reading at the second or third grade level. (I honestly didn't see the point in circling everything that started with M.) She didn't explain to me that part of the point was to do the work anyway, as a matter of learning to complete tasks and prove that you can do the work. She used to write "does not follow directions" on all my report cards, and once told my mom she had nightmares about me, which I think my mom resented. But here she was, genuinely glad to see me, an adult talking to another adult. At 18 years old, I finally got to see Mrs. Livingston as a regular human being, and I really liked her. And I remembered that Mrs. Livingston used to read stories and poetry to us, A A Milne and Ogden Nash and lots of other stuff. That alone more than made up for any misunderstandings between us. 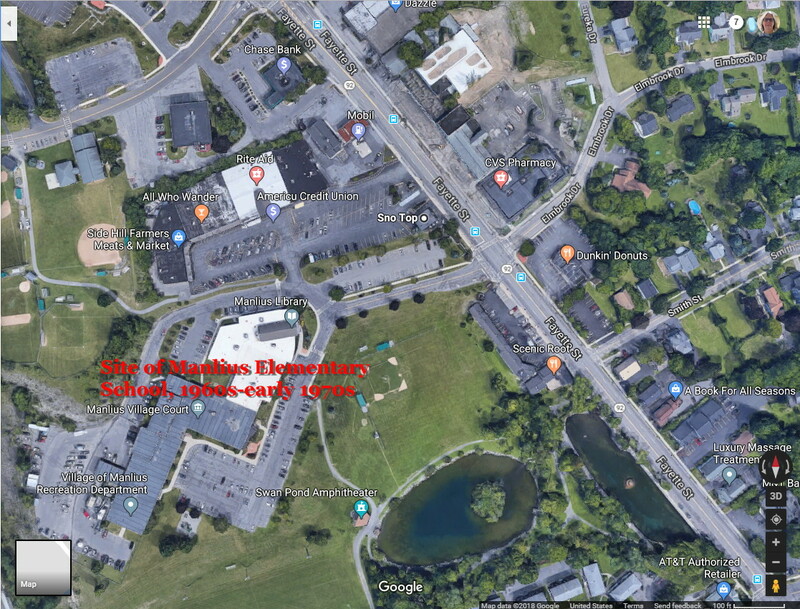 Google Map of where Manlius Elementary used to be. I enjoyed chatting with both teachers, and left the place feeling both grown-up and appreciated. It was lunchtime, so I headed over to the Manlius location of Burger King, which had just been converted over from a Carrols Restaurant, the local burger chain I'd grown up with. Standing in line at the counter, I noticed Miss Olds, waiting right behind me to order her own burger. She laughed and smiled. "Synchronicity," she said. Synchronicity was a word I'd heard before, but I wasn't quite sure what it meant until I went home and looked it up. On my last day of high school, my third grade teacher still had things to teach me. And the next day? I graduated, of course. I think the gowns were in forest green, one of the school colors. We had a picnic in the back yard afterward, and my parents gave me a Coronamatic typewriter. Good Morning, Good Morning, good! This week's Round Robin Photo Challenge is called For a Song. My inspiration, at least in part, was a book called The Beatles' Illustrated Lyrics, which I borrowed from a friend of my mom's many years ago. So, naturally, on John Lennon's 70th birthday, I'm illustrating a Beatles song. It's one of Paul's, but close enough! A thousand voices of thanks to my friend Kevin Harrington, who played the Fool for my camera. Let's see what everyone else illustrated for us! Even as astronomers discover planets that may be capable of supporting life, such destinations remain out of reach of would-be human colonists, even if the world is "only" twenty light years away. But if some science fictional technology were discovered in the next year or two (warp drive, matter transmission or whatever) that made it possible to leave Earth behind and go live on another planet, would you be tempted to do so? If you choose not to relocate, would you be interested in just visiting the place instead? Extra Credit: If you did go, whether on vacation or as a colonist, and you were only allowed to bring one small suitcase with you, what would be in it? 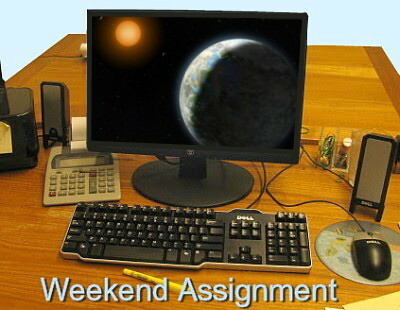 Last week there was a bit of a media flurry about the discovery of a "Goldilocks planet." That's a planet whose orbit around its sun makes it not too hot, not too cold, but potentially "just right" for life to develop. I found out about this via my Facebook "Home" page, on which someone had posted a link to the NPR article about the discovery. That Facebook link attracted a large number of comments, some humorous, some political, about who should pack their bags and move to this other planet, twenty light years away. It was pretty evenly divided: many of the people humorously claimed to be packed and ready to leave, just on general principle; others wanted to ship tea party folks or some other political group off to the planet, so that Earth could be rid of them; a third group wanted to lead a group of their own political persuasion off to the new planet, leaving Earth to the reactionaries (or whoever). Joking aside, I don't care for that kind of political rhetoric. We're all from this planet Earth, and we all have the rights and responsibilities that stem from that, to take care of the planet and to get along with each other as best we can. The first people to go live on a different planet (if this were possible, which certainly isn't true now and may never happen) would be the lone wolf explorers, the risk-takers, the trailblazers, the visionaries, not people who happen to hold one set of political views or another. As much as I might like to think so, that's not me. Still, the time might come, as in the 1600s, when people of a particular political, philosophical or religious persuasion might band together to colonize a planet together, not because they've been kicked out of Earth but because they see another planet as providing opportunities for a better life, lived according to their own principles. And once a planet is tamed and settled, it may well provide vacation or research opportunities, without the long-term commitment. So let's say it's 2015, 2050 or 2110, or some other arbitrary future date when the many problems surrounding the prospect of interstellar travel over vast distances have somehow been solved. Medicine has also made miraculous advances, so I am more physically fit and mentally alert at age 93 (or 153) than I was at age 30. (Yes, this is a fantasy scenario.) I don't even need glasses any more. The Goldilocks Travel Bureau is offering one month, one year and lifetime (one way) excursions to the planet Horton. The trip by wormwarp luxury starliner (with five meals a day, onboard entertainment and a swimming pool) takes just three days each way. Am I going? If so, what package do I choose? First off, I want to know whether John is going too. I asked him, and his answer boiled down to "it depends." "I'm certainly not ruling it out," he said. So let's say the conditions are right. We're healthy and wealthy and bored, and we can even take our dog Ponsonby with us. Okay, then we're going! But for how long? I don't know about you, but I find the ends of vacation trips rather frustrating and depressing. 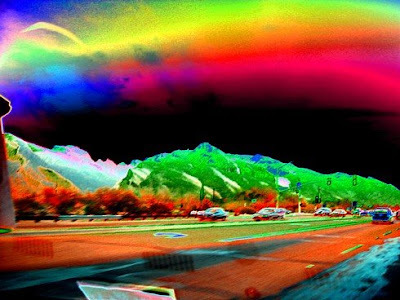 I never feel we've done and seen everything there is to do and see. And a whole new planet - there should be a lot to do and see, right? If this is a human-friendly environment, there's a good chance that Horton has as much environmental variation as Earth - hot places and cold places, oceans and rivers and desert, mountains and plains, and a whole new set of flora and fauna to admire. Yeah, I think we'll take the one year package, please. And if we get bored or overwhelmed, I'm sure we can find a quiet place somewhere on this newly-tamed planet that someone has fixed up with all the comforts of home, by which of course I mean an Internet connection. Well, and Earth crops. 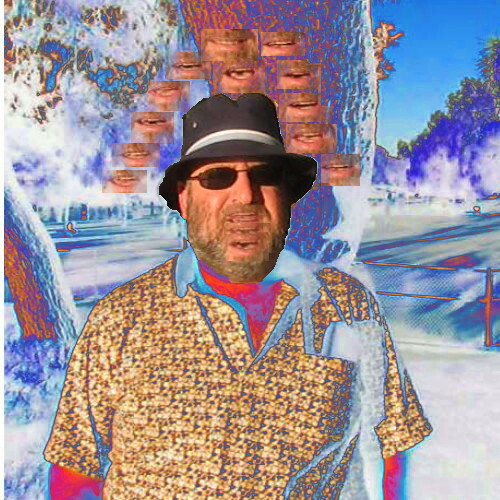 Give me a computer with access to all the books, tv, films, periodicals and social networking in the known Universe, and access to chocolate, diet orange soda and other necessities of life, and I'll be happy. I'm sure I can handle a year without DVDs or vintage toys. As long as I can still watch Doctor Who and go to something resembling a church on Sunday, even if I do so virtually, I'm golden. Wait - on second thought, I'd better bring a camera and a PDA or laptop for the trip over. I'm assuming there will be facilities for cleaning and replicating clothing. When the year is over, though, I'll be glad to go home, back to the familiar lands of Earth, the silly possessions that clutter the Museum of the Weird. Maybe by then we're in a big house and all our stuff will be nicely organized instead of in boxes. That would be nice. In any case, I'm sure I would be struck anew by the wonders of Earth, the mountains, the plant life, the birds and beasts and especially the dogs.